Just finished this board for a client yesterday. I kind of want all the stuff for myself though. I love those little bottles, where are they from? And I recognize the green pillow from WalMart. Love this room. Love this. 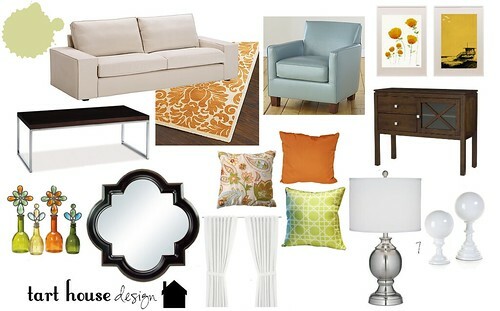 I just painted my living room this green color, and I now see I need to add some orange to the mix! Thanks for the inspiration! Wow, looks great! I really like the colors and all the clean lines. Fun design board! Love that floral pillow and the colors you used.